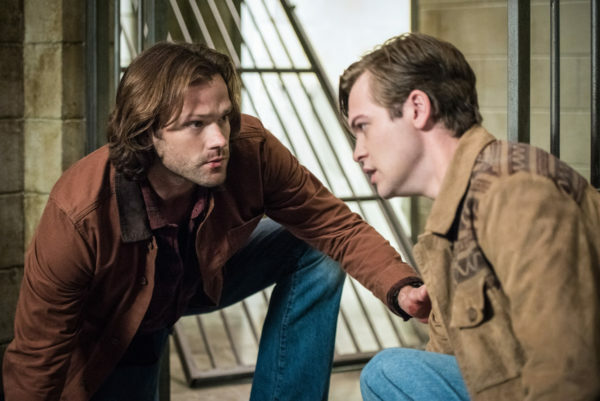 As we move into lucky number 13 of Supernatural, the season recap was accompanied by “Nothing Else Matters.” A fitting tribute to the somber feelings we were left with last year. Hope is lost, and the Winchesters are alone. 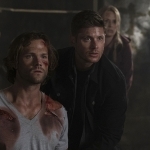 There were three major character focuses for the season premiere: Sam, Dean, and Lucifer-offspring Jack. They made for an interesting, though complicated, triad dynamic. One is trying to find his even keel again, one is fatalistic about the current situation, and the third is trying to find his way in the world. It’s going to be an interesting journey with the three of them. Jack got aged up really fast, as we saw in the season finale, and the mystery of why that happened was soon revealed, along with some other aspects of this one-of-a-kind nephilim child. Knowing his heritage, I think the audience, along with Dean, were in the same line of thinking. We don’t know what to make of him, but we automatically fear the worst. And again and again he proved that he might not be inherently evil, but just holding the potential of too much power and not enough guidance as of yet. 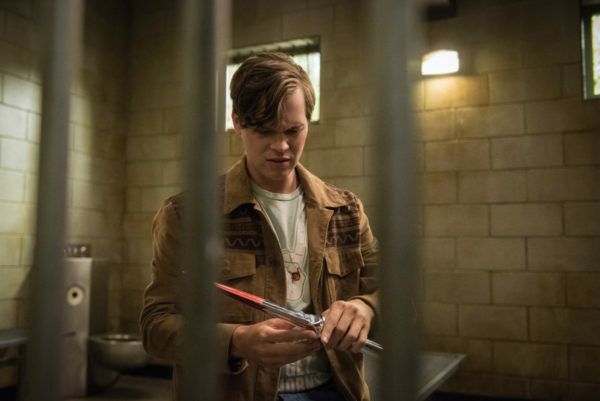 After he escapes from Dean and Sam, admittedly an understandable move since Dean tried to kill him, he is a mere child trying to find his way in the world. As he is questioned at the police station, we find out that he does have a bit of awareness inside him. He knows his mother is dead, and we later learn that she is the one who taught him to speak. And he knows who his chosen father is, even if he doesn’t know where his genetic father is. Seeking out Cas to be his role model, his father figure, was a touching possibility, but we won’t get to see that come true at the moment. Instead, he is left with Dean and Sam to serve the role and keep him on the right track of nurture versus nature. I hope they can help him understand and control his powers before he destroys the world. Sam is trying to serve as a balance between Jack and Dean. He sees the potential for the brothers to do good, to help this child learn and grow, destined not to be a destroyer. And I believe he sees much of himself in Jack. He’s the boy with the demon blood, he’s the one that was always destined to turn evil, serve Hell, embody Lucifer. But he made his choice, he fought for what was right, and he overcame that destiny to be the savior of the world many times over. Sam can perhaps do the same thing for Jack, and help him learn that just because you’re born with a destiny doesn’t mean you can’t overcome it. And perhaps, in the process, he can help Jack open up the door between worlds again so that they can hopefully save Mary. Sam is holding onto the hope that she’s still out there, and that they can see her again. In such a dire situation, someone has to be the light. And finally, we have Dean, who is just a mess. He has lost everyone and everything. Dean watched Crowley sacrifice himself, he saw Mary jump into the void with Lucifer to what Dean is sure is her death, and he stood over Cas’s lifeless body with the knowledge that his friend was never going to come back. 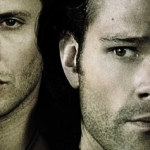 Dean prayed, begged Chuck to make things right again, but God’s not listening at the moment. They are well and truly alone in the world and he is falling apart as a result. I was a bit surprised that Dean flat-out told the cop who they were and what they do. There is no longer a need for cover stories where Dean’s concerned and maybe that’s a side effect of what’s happened. He’s done pretending, he’s done trying. This is their world now and he’s trying to deal with the enormous loss they’ve experienced. And one way to start that process is by giving Cas a hunter’s funeral. Dean has accepted that Mary is dead, even if Sam hasn’t. He’s accepted that God is not going to come in and make things better again. And he’s accepted that his best friend, the one he could rely on despite their ups and downs to always be there, is never coming back. 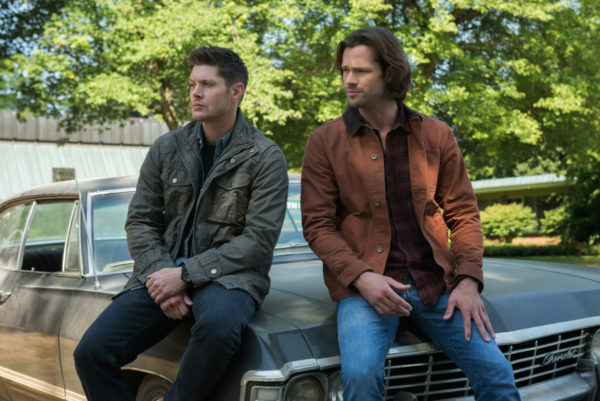 It’s Sam and Dean against the world, with Lucifer’s love-child in the backseat. Going to be an interesting road trip this season, to be sure.